The S&P Indices Versus Active (SPIVA) Europe Mid-Year 2018 Scorecard is often cited for its latest headlines surrounding the active vs. passive debate. 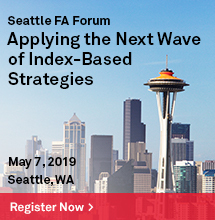 But beyond the SPIVA headlines, there is an extensive offering of insightful data that has been carefully measured and presented to help readers dig deeper. 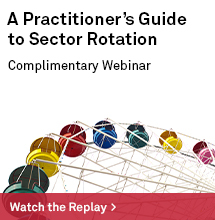 Let’s look at just one example from the latest SPIVA Europe Scorecard and discuss the treasure trove of information that can be gleaned from the report. 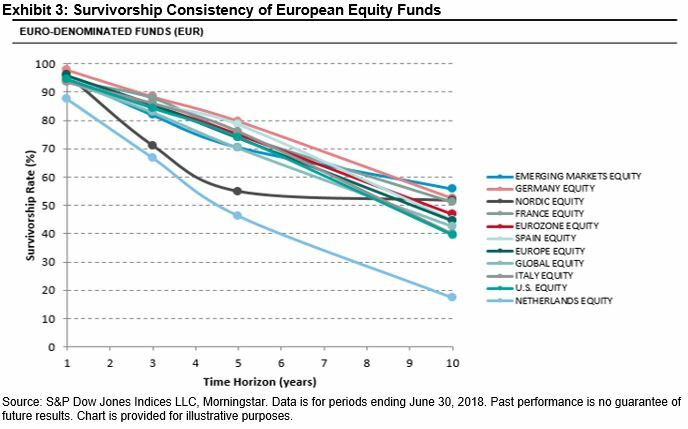 Headline: 59% of active pan-European equity funds (euro-denominated) failed to beat the S&P Europe 350 from June 2017 to June 2018. First, how does this headline figure compare to its track record over longer time periods and to other fund categories? The proportion of funds in the category failing to beat the same benchmark rose to 87% over the 10-year period. 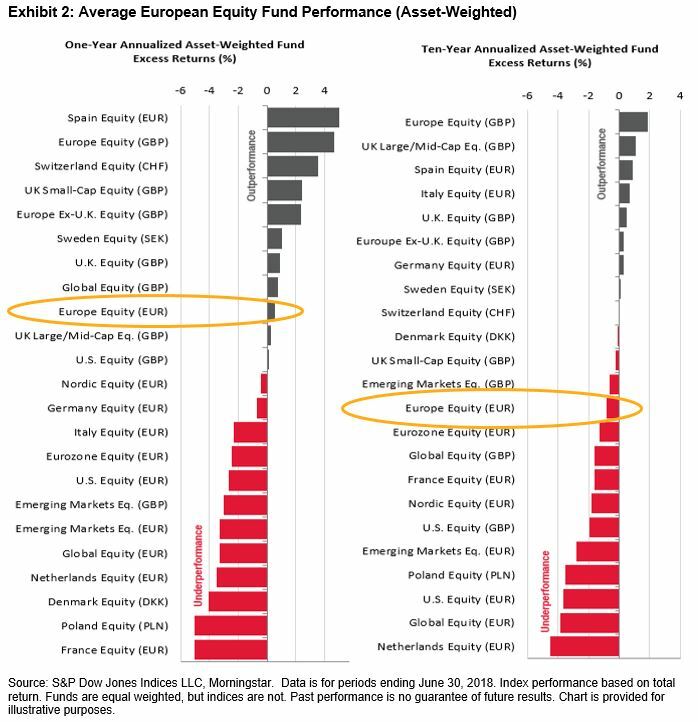 While these figures may appear high, European active funds investing in U.S., global, or emerging market equities appeared to do markedly worse. 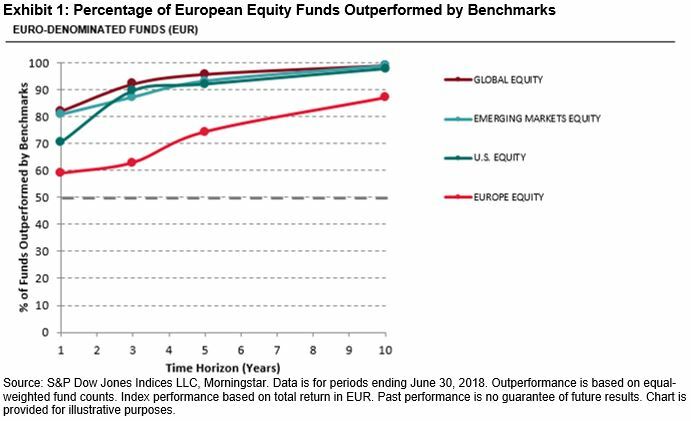 Contrary to what the headline may suggest, active funds investing in pan-European equities collectively outperformed the S&P Europe 350 over the one-year period. The average asset-weighted return for the active fund category was 4.02% from June 2017 to June 2018 (equal-weighted return was 3.75%). In comparison, the S&P Europe 350 one-year return was 3.46%. 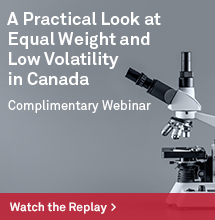 Asset-weighted returns may be considered a better indicator of fund category performance compared to equal-weighted returns, since they reflect the returns of the total money invested in that particular category with more accuracy. When asset-weighted returns are higher than equal-weighted return calculations, then we know larger funds typically did better. See how the returns compared to other fund categories in the one-year period and over longer time periods in Exhibit 2. We already know there must be a skew in the returns across the funds in this category, since the average fund return beat the benchmark while the majority did not. Put another way, the mean was higher than the median return. The quartile breakpoint report (Report 5 in the SPIVA Europe Mid-Year 2018 Scorecard) takes this analysis one step further by giving the performance of the actual fund, which sits at the 25th, 50th, and 75th percentile by rank. For our headline category, the third quartile fund had a performance of 0.47% in the year; nearly 3% lower than the benchmark. The first quartile fund had a performance of 5.6% in the year; just over 2% better than the benchmark. This imbalance suggests that relatively few funds may have done particularly well. How does the survivorship rate compare to other fund categories and, more importantly, how consistent is it through time? 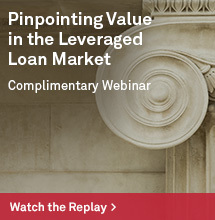 The survivorship report in the SPIVA Europe Scorecard tells us there were 1,101 funds used to calculate this headline figure. These funds represent the opportunity set available at the beginning of the period in this category. If we were to calculate the figures using only surviving fund data then any conclusions could be biased by excluding funds that would have liquidated or merged due to poor performance. Since the headline figure counts the funds that survived and beat the benchmark index, it is also useful to see the survivorship rate in isolation. In this case, 96% of the 1,101 funds survived the one-year period of analysis. Over the 10-year period, the survivorship rate drops to just 45%. As can be seen in Exhibit 3, this is widely typical across all fund categories. To take a look at more headlines and all of the related reports that help our readers see the full picture, please see the latest SPIVA Europe Mid-Year 2018 Scorecard.